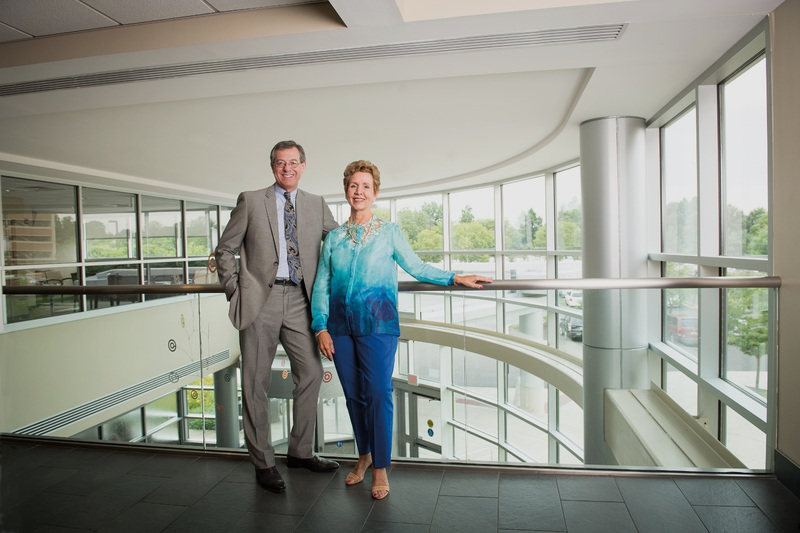 Healthcare champions Jeanne and John Hubbard are the embodiment of a quintessential partnership. Married for 37 years, their personal and professional lives have taken them around the country and around the world landing in the Doylestown area not once, but twice. Doylestown Health Foundation recently spoke with them about their ongoing involvement and philanthropic support. Q. Jeanne and John, how did you first become acquainted with Doylestown Health? Jeanne: When we lived in Montgomeryville in the late ’80s, we got to know Doylestown Hospital through a few trips to the emergency room. Over a period of ten years, we saw the growth really begin. John: Back then it was a very nice community hospital. We moved out of state and when we returned to the area after nearly five years, we knew we really wanted to get more connected with the community and Doylestown Health became the conduit because of Jeanne’s involvement with caregiving for our parents. Q. Jeanne, what was it like to return to Doylestown and see all of the changes that had taken place at Doylestown Hospital? My parents lived with us the last five years of their lives. They had five specialists between them and I was their caretaker 24/7. When you’re in the hospital for 66 appointments over the course of a year, we joked that visiting the doctor became our social life. Through that we witnessed the changes firsthand. It was a natural evolution, a natural progression and inspiring to see. Q. John, as President and CEO of BioClinica, you witness the rapid pace of change in healthcare. How have you seen Doylestown Health stay relevant? What is unique about Doylestown’s approach? It’s one thing to bring in the latest approaches and technologies, but what I’ve been really impressed with is Doylestown’s focus on recruiting top talent with fantastic credentials from leading medical centers who are a good fit with this culture. Where healthcare is going—the care of patients will become even more multidimensional. Doylestown Health has embraced that. You feel a personal connection here like you are part of a family. That softer element makes this a really special place. It’s not just an experience that’s shared by a few—it’s that way with everyone who comes here. Q. What inspired you to give to Doylestown and what led to your generous gift to support Friends of the Heart Institute in their $1 million commitment to the Center for Heart and Vascular Care? Jeanne: We are deeply grateful for the Heart Institute. Dr. Auteri took my dad through valve surgery and he gave us one more Christmas with my father. For my mother, we had to make a decision for end-of-life care. We needed hospice, and Doylestown was exceptional. Our contributions just became a huge thank you to those areas. Our gift to Friends of the Heart Institute is in honor of the volunteers that were so helpful. The hospital’s Heart-to-Heart volunteers recognize the panic, fear, lack of sleep and sit down to help you and sometimes just listen. There are times you don’t want to talk to your family and friends because they are so emotional too. The Heart-to-Heart volunteers have been through a similar personal experience. They also sense whether you need rest, food, etc. They were amazing to us. John: Running a hospital is an extremely costly endeavor. In order to keep up with how healthcare is evolving, you can’t stay static. You need to invest in facilities to grow and meet the needs of patients and the communities you serve. We want to make that happen and take the heart program to the next level. Q. What does it mean to “Lead with Care”? In your experience, how have you observed physicians, nurses and others leading with care at Doylestown Health? Jeanne: No matter intellectually what you know about a disease or stage of life—sometimes you feel really alone. There could be millions of people with the same thing but you can still feel isolated. Physicians and nurses who share some of their life story within the context of whatever you are going through by giving you an example like, “I know what end-stage dementia looks like—this is the progression.” I think that is leading with care. Someone who can reaffirm you and it boosts you at that moment. That happens here all the time. John: I think of leading with care on a variety of levels. Primarily because caregivers start the interaction with you as a human being and not just as a patient. They are learning about you as an individual before they provide healthcare support. You relate to them as a professional and a person.